I was excited about reading this book because I thoroughly enjoyed Death’s Acre , written by Jon Jefferson and Dr. William Bass before they became Jefferson Bass. While this book was a great choice for the Mysteries from Every State Challenge, I was a little disappointed with the plot, but that may be because I had extremely high expectations. 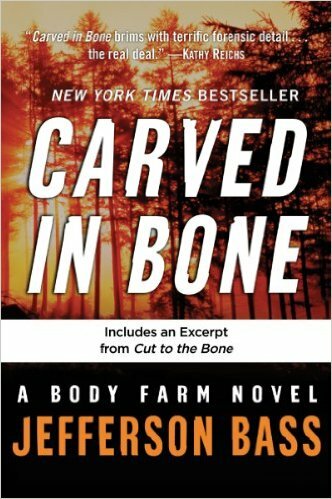 For those not familiar with Dr. Bass, he is a renowned forensic anthropologist and founder of the University of Tennessee Anthropological Research Facility, better known as “The Body Farm,” where Dr. Bass and his students study human decomposition in a vast array of settings and situations. While macabre at first blush, Dr. Bass’s research is fascinating. I strongly recommend reading Death’s Acre . After finishing the book, I did feel like I had a deeper understanding of places like Cooke County, and I felt like I leaned a lot about the state. One of the most interesting things I learned was that Tennessee is know for growing an especially valuable kind of wild ginseng, the cultivation, sale and export of which is tightly controlled by the state. Wild ginseng is a multi-mullion dollar industry in Tennessee and may not be harvested on public land. Dealers must have a special permit to buy or sell ginseng and the state sets the harvest season. Of course, the forensic part of the book was fascinating. Bass brings in his huge catalogue of knowledge and experience to weave an interesting tale about a mummified body found in a cave deep within Cooke County. The plot, however, was not as fascinating as the forensic information and anecdotes included in the book. I don’t really know why I didn’t like this book more, because I was really hoping to start a new series to obsess over. However, it was a fun, easy read with a great forensic base that makes reading it worthwhile. Sounds like something I want to read. Thank you.